Bioglan Melatonin Homeopathic Sleep Formula, outrageous claims (the analogy with vaccines), packaged like medication and sold in pharmacies, winner of Choice 2018 Shonky award. See latest complaint: Pretorius, Bioglan, Healthy Care Homeopathic Products. Blackmore’s Men’s Performance Multi “Blackmores Men’s Performance Multi contains nutrients to help you get the most out of your day, with additional ingredients specially selected to support performance, including: Tribulus: traditionally used in Chinese & Ayurvedic medicines to support male sexual performance”. Uses the TGA “traditional evidence” get of jail free card. Caruso’s Anxiety Aid “In a clinical trial conducted over a period of 15 days, Cyracos® showed a 69% reduction in symptoms associated with mild anxiety”. Unreferenced open label, non-randomised pilot study of 20 people about which even the authors said, “It is critical that further studies incorporate a placebo and investigate physiological stress markers” . In short, a triumph of hype, celebrity endorsement and regulatory inaction over science! Are there any useful complementary medicines? Yes, there are a few! For example, folate for women wanting to get pregnant (preconception) and in pregnancy, iodine during pregnancy and while breastfeeding, Vitamin D in people with deeply pigmented skin, or chronic and severe lack of sun exposure for cultural, medical, occupational or residential reasons. But most Australians can get what they need most of time from a healthy diet containing fish, fruit and vegetables. Supplements are no substitute for the latter! 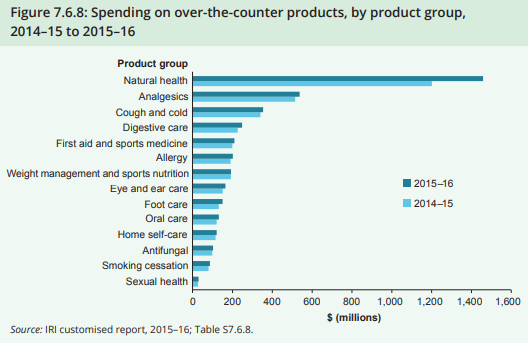 This entry was posted in Complementary medicine, Pharmaceutical Promotion and tagged ABC, AIHW, Bioglan Melatonin, Blackmores Men’s Performance Multi, bone fractures, Caruso’s Anxiety Aid, Choice Shonky, FatBlaster, FatMagnet, TGA, Vitamin D. Bookmark the permalink.